Even my toddler loves it!!! 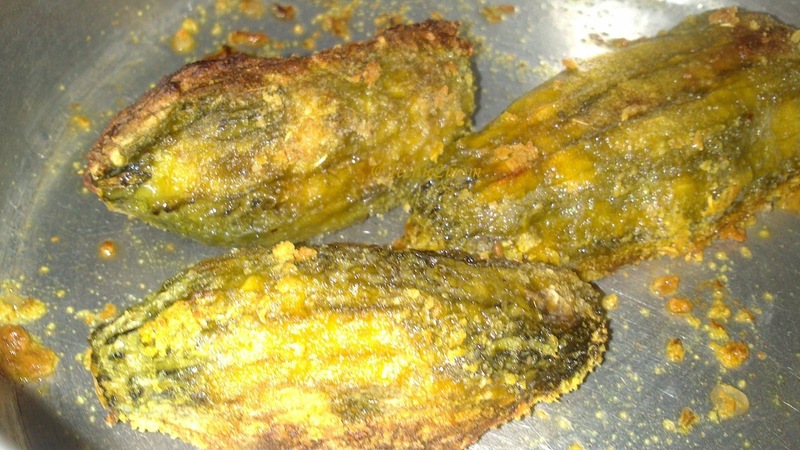 Calls it crispy karela and enjoys them!! Apparently i did the same when i was young (well, i still enjoy them 🙂 and i still am young ok?!? maybe not as young as i used to be but still young ;)… i called them bharela Talela baandhela kaarela (Stuffed fried tied kaarela)!!! My mom makes them by shallow frying…But recently i tried making them in my oven in grill mode!! And they tasted perfectly crispy!!! So now we use less oil but get same taste!!! Isn’t it great?!? 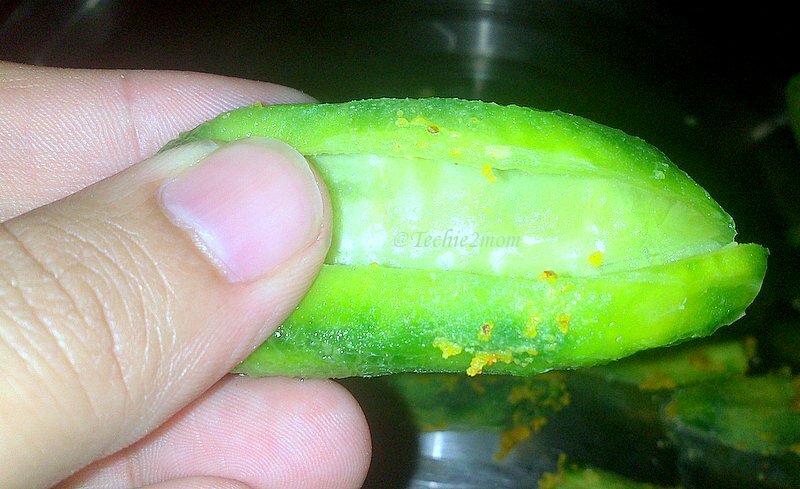 1) Wash and peel the karelas. 2) Now make a vertical cut on a side and remove all the seeds. 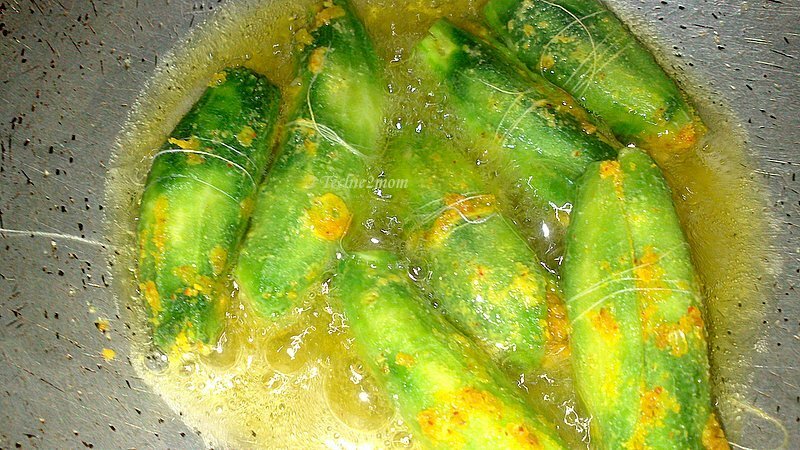 Rub salt in each karela and leave aside for an hour. Seeds removed, salt rubbed and ready to stuffed..
4) Stuff this inside the karela generously..
Once Out, cut the thread (of course, we are not eating the thread 🙂 ) and cut the karelas in bite size pieces and enjoy the crispy karelas with hot fulkas and Gujarati daal!!! 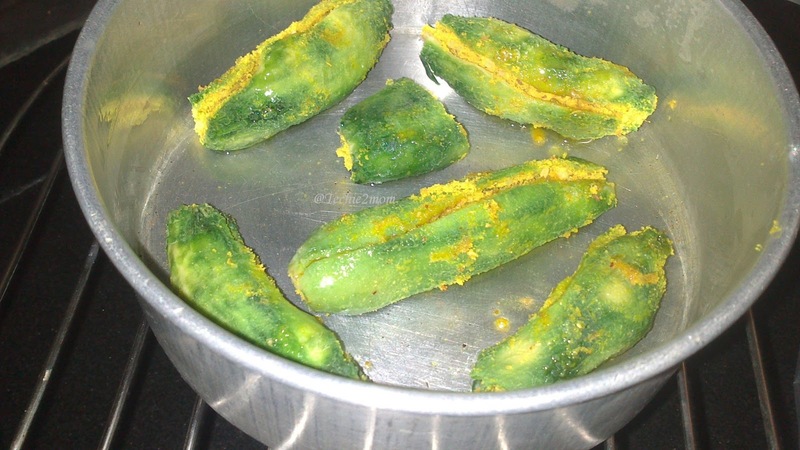 1) You can also make these karelas in a non-stick pan with less oil. I don’t do that coz i am not a big fan of non-stick cookware. But if you don’t mind using it and want to reduce the amount of oil then go for it. Previous Post: Chocolate Melting Moments – Spritz Style!!! Next Post: It’s raining Awards!!! Love the filling and yummy taste. I'm going to try bharva karela with besan….lovely..
Have seen ur prof every time I visit Priya's space..Glad to land up on ur space 🙂 Am ur new follower !! Awesome ! this is a great way of perking up Karelas ! Thanks Sonali….Hope you find Karelas, make them and enjoy them.. 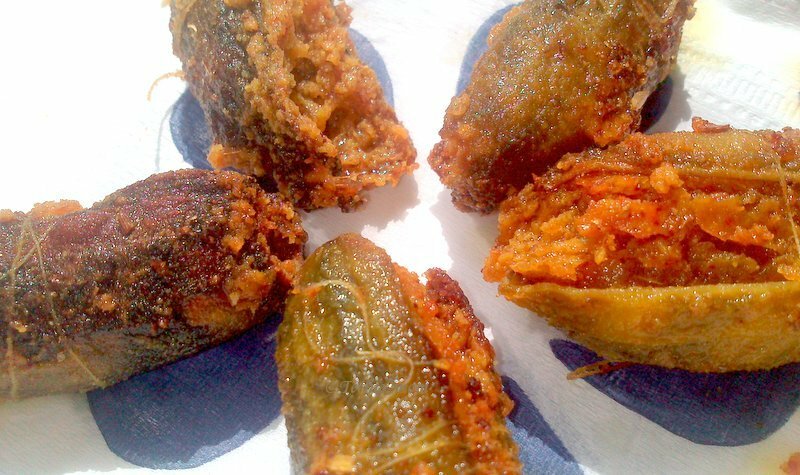 I would love to try out this fried gourds. We eat bitter gourds very often, actually it works best for our half's diabetes. Brilliant recipe and I am keeping it aside for my cooking venture. These look fantastic! I've personally never had anything like this before so I'll definitely give these a try. Thanks Justin…Let me know if you need some help while making it.. Try it out to see if you convert to a fan!!! loks gud, dear. nice stuffings. My favourite veggie but I have not tried this way of preparing them.. Happy blogging..and glad to follow you.. Stuffed Karelas look gr8! Never tried this before. Thanks for the recipe. First time here. Loved your space. 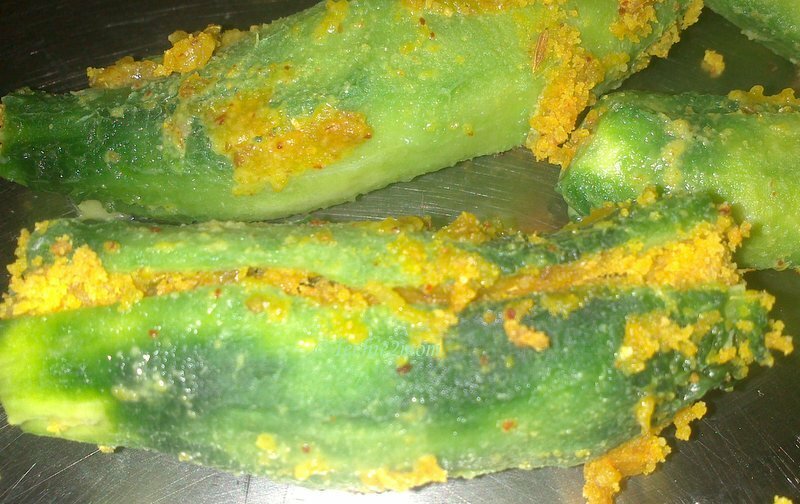 Thanks for visiting my website.. You have a nice space.. stuffed karela looks mouthwatering..